Thanksgiving is the mother of all meals in America. The one day when tradition trumps food trends and the tables are groaning under the weight of all the food. Each year thousands of occasional cooks are expected to produce a feast that is challenging for the pros. The pressure to recreate childhood memories is intense. The Artist and I have been talking a lot lately about the need that many people have to recreate exactly the same Thanksgiving meal year after year, most being absolutely unbending on the menu. They MUST have the same overcooked turkey, sweet potatoes with marshmallows and the green bean casserole. If you are bored and want to try some new recipes, I may have an answer for you. Many of the dishes we have at Thanksgiving are only served once a year, maybe twice if you repeat it at Christmas. If you prepared them periodically throughout the year I doubt there would as much insistence to include them at every single holiday meal. There is no reason not to cook turkey throughout the year, maybe not an entire bird but just a breast if you don’t have a huge family to feed. Keep most of your traditional foods, but consider introducing a new side dish each year or a different way to make your normal ingredients. It can be a fun adventure and you can have your family vote on whether to keep it for the following year. When the #FoodNetwork asked us to write about our favorite Thanksgiving side dishes for #FallFest, I wanted to share something that I love making all year long but that also usually shows up at Thanksgiving because it is so easy to make and doesn’t need any last minute attention. When I have a house full of people, am being distracted at critical moments and cannot afford to make mistakes, I turn to recipes like today’s Maple-Roasted Root Vegetables. The beauty of a recipe like this one is that it can be prepped and made in advance and kept fresh in the refrigerator up to two days in advance. Adding a splash of maple syrup and maple vinegar creates a lovely, subtle hint of sweet and sour that complements the saltiness you expect. I love surprising my guests and waking up their taste buds! Red beets bleed, turning everything pink/red. Roast them separately and toss together right before serving. And, as always, feel free to change up the ingredients to suit your likes and dislikes. If you love parsnips and turnips, include them. If you can’t find purple potatoes, leave them out. If your family hates beets, forget them. The idea is to create a dish that everyone at your table will love and beg you to make again! • Do your menu planning early. You do not need a ton of different recipes, just good food and plenty of it. • If people are bringing food, be specific – give them assignments and ask them to bring serving spoons and whatever they need – find out if anything will need to be reheated. • Do your shopping as early as possible to avoid the crush at the last minute. Expect crowds and go in with a positive attitude – everyone will be happier! • Print out copies of the recipes you will be making & tape them up on your kitchen cabinets. This keeps them off the counters and out of the way as well as putting them at eye level. • Create and print out a schedule of when to make each item; tape it up next to the recipes. • Figure out which recipes or components of recipes can be made ahead and stagger your tasks so you are not overwhelmed on Thanksgiving day. • Mark off ingredients as you add them/steps as you complete them so you don’t get lost if you are making several things at once or are interrupted. Keep a pen hooked to your apron and slip the timer in your pocket in case you are called away from the kitchen. • Set your dinner table up to a week in advance. Set up the buffet with the serving pieces you will be using and label each one with what will be in it. Think about creating varying heights and colors as people move along the line. Include all serving utensils you will need. Cover the table and buffet with a sheet to keep everything clean, removing it the morning of Thanksgiving and adding the centerpiece that morning. • Bake your pies a day in advance – your oven will be busy with the turkey on Thanksgiving day. • Consider grilling your turkey instead if you want to make dishes that need to be baked. • Roast extra legs and wings ahead to make stock from. Use the stock to flavor your dressing and make the gravy. When you make this ahead and refrigerate it, the fat will rise to the top and solidify, making it very easy to remove. Save it to make the gravy with. The stock can be made several weeks in advance and frozen, or a couple of days ahead and refrigerated. • The gravy can be made a day ahead. Reheat it and add any drippings from the turkey roasting pan to boost the flavor. This way you can make it without the pressure and it will turn out perfectly every time. If there are any small lumps, just press it through a wire sieve for a nice smooth gravy. Most of all, remain calm, take deep breaths and walk away for a 2-minute break every once in a while. It will help you stay focused during the day and recharge your battery. I hope these ideas help you have the best Thanksgiving ever and make sure to check out the other recipes from my friends below and our Pinterest page for even more ideas for Thanksgiving side dishes! If you cut all the vegetables into cubes about the same size, they will cook more evenly and you won’t have some pieces that are underdone and others that are overcooked. And if you make them bite-sized, they are much easier for your guests to eat without having to cut anything. This dish is naturally gluten-free! Cutting round vegetables or anything with rounded edges that won’t lay flat can be challenging and a bit dangerous if you aren’t careful. First of all use a very sharp knife. The sharper your knife, the less pressure you need and the less likely it is to slip and cut you. More kitchen injuries happen because of dull knives than any other cause! The second step to make this safer is to cut a thin slice off of one side. This creates a flat surface that is very stable and easier to work from. Once you have a flat surface, always set that side on your cutting board and then continue with your slicing. And don’t forget to keep your fingertips curled under on your non-cutting hand in the shape of a claw! Set a rack in the center of the oven and preheat to 350°F. Rinse all the vegetables in clean water and place on a cutting board. Chop or cube as directed and place in a large, shallow roasting pan. Drizzle the oil and maple syrup over the top and sprinkle with the rosemary, salt and pepper. Add the maple vinegar if using. Toss the vegetables until everything is mixed and coated with the oil and maple syrup. Place pan in the hot oven and roast for 20 minutes. Carefully stir the vegetables and continue roasting for another 30 to 45 minutes or until a fork can be easily inserted in the largest pieces. Remove from the oven, toss again, and serve hot. If made ahead, cool and store in a covered container in the refrigerator. Reheat before serving. Can be made up to two days in advance. Don’t miss these amazing recipes from my friends! Unauthorized use, distribution, and/or duplication of proprietary material from The Heritage Cook without prior approval is prohibited. This includes copying and reprinting content and photographs. If you have any questions or would like permission, I can be contacted via email at theheritagecook (at) comcast (dot) net. Feel free to quote me, just give credit where credit is due, link to the recipe, and please send people to my website, www.theheritagecook.com. Please see the Disclaimers page for additional details. « I Heart Circulon GIVEAWAY plus Sage and Cranberry Rice Pilaf! 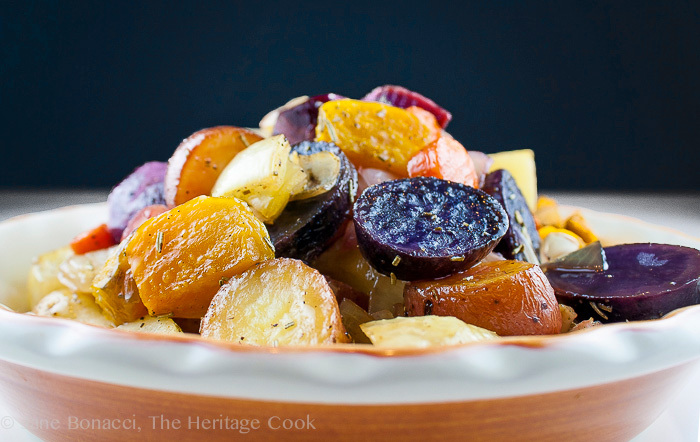 I love the idea of sweet and salty in the roasted vegetables – and they are so colorful! Thanks Liz! I loved your side dish too – Thanksgiving is the greatest holiday!! Great tips for preparing the Thanksgiving feast Jane! I used to make everything on Thanksgiving Day. Not sure why it never occurred to me that I could make so many dishes ahead of time. After all, that’s what catering companies do. Now, I make the sides the day before, and everything else on turkey day. Love your beautiful roasted vegetables – so pretty! Happy Thanksgiving! Thank you Jeanette. I watched my mother struggle each year slave for hour after hour getting the meal made in one day. Now I plan items that are better on the second day and that eases my day-of work load! Happy Thanksgiving to you and your family! !